Fixing “Unable to monitor filesystem” Dropbox issue on Ubuntu. Once Dropbox throws you an error that reads “Unable to monitor filesystem. Please run: echo 100000 | sudo tee /proc/sys/fs/inotify/max_user_watches and restart Dropbox to correct the problem.” you’d better adjust settings in a system config file, to keep changes after reboot. Save the file (Shift-ZZ, if you are new to Vi). Reboot computer to apply settings and restart Dropbox. This entry was posted in Linux, Linux_App, Web and tagged Dropbox, File monitoring, Ubuntu on October 2, 2013 by enddl22. <i>You should call target_link_libraries only after you have called </i><i>add_executable for the given project. Otherwise, CMake doesn't yet know </i><i>about the executable. This entry was posted in Linux, Linux_App and tagged cmake, CMakeLists.txt on January 10, 2013 by enddl22. Keyboard input setting in Ubuntu. 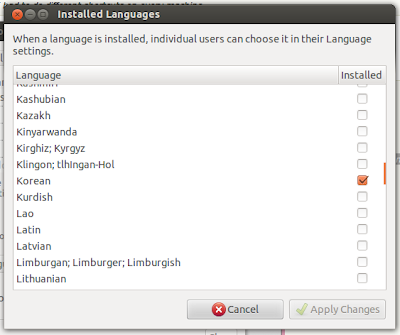 After installing Ubuntu, go to language support. Choose Korean to add language.Then, restart the system and go to “text entry” and choose “korean (hangul)”, not just “korean”. If you choose just korean from text entry, you can’t see korean characters even though the input language already has been changed to korean. Please have a look the following link. After Korean language pack installation, one might need to set up input method in the Language support window. Log out also is required. The above page is deprecated and no longer valid. Install Korean keyboard layout by going to System Settings> Keyboard Layout. Click on “+” sign at the left bottom corner, select Korean from the list and close. Click on Options button and select Keys to change layout, then select from drop-down list of checkboxes Left Alt + Left Shift and close the window. Enable Korean language support by going to System Settings> Language Support. Click on Install / Remove Languages, select Korean from the list and Apply Changes. Select ibus as the Keyboard input method system. Type ibus in the dash and run Keyboard Input Methods application. The IBus preferences window will be opened. 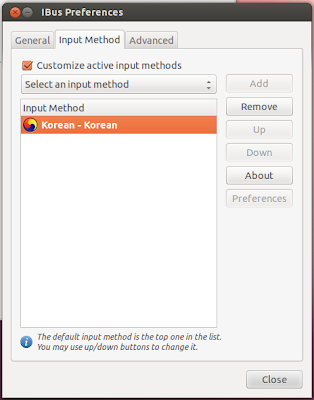 Select ‘Input Method’ tab, then ‘Select an input method’ combobox and Korean from dropdown menu. To switch between Korean Hangul mode and English ‘Roman’ mode: use Ctrl – Space keys combination (set by default). You need to reboot the Ubuntu. This entry was posted in Linux, Linux_App and tagged keyboard, Korean, Ubuntu on December 20, 2011 by enddl22.